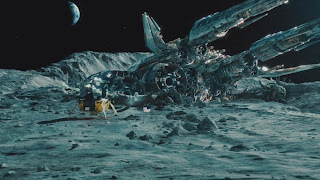 Transformers: Dark of the Moon defies criticism. It is what it is, and, by this point, you're either on-board or you're not. Those who enjoyed 2007's Transformers or 2009's Transformers: Revenge of the Fallen will once again be treated to well over two hours of CG robot mayhem, relentless violence, broad humour and heavily made-up Maxim-esque actresses. Michael Bay doesn’t attempt to upset the applecart; he delivers exactly what fans expect from him, and closes out his gargantuan, tin-headed trilogy with enough fireworks to fuel a century's worth of Fourth of July celebrations. Although I can respect Bay's tireless attempts to expand the already-massive scope of the franchise, and gleeful dedication to detonations, I still feel left out in the cold. Watching Dark of the Moon, I didn't experience the visceral sense of irritation I did for the first or second film so much as faintly amused indifference. Sure, the effects are state-of-the-art and the action is well-executed. But why should I care? It remains fascinating how little Bay is interested in the Transformers. Oh, there are plenty of the towering, mechanized aliens in the film, except few of them have a personality, much less dialogue. We've spent three films with Autobot leader Optimus Prime and what do we really know about him? That he fights for good, dislikes Decepticons, and is sorta friendly with Shia LaBeouf's character. Outside of Peter Cullen's booming voice, he brings very little to the proceedings and exists to recite solemn platitudes, war cries and dull exposition, and chop down bad guys. And, sadly, he's the most well-rounded non-human character. The rest - including the popular Bumblebee, who has maybe 15 minutes of screen-time - are technically impressive background ciphers, defined by their funny accents and powers (or, in one case, inexplicable resemblance to Albert Einstein). If you had told me in 2007 that the villainous Megatron's character arc would culminate in him donning a cape, sitting quietly on the ground for an entire battle, and being verbally ridiculed by a Victoria's Secret Model, I'd have called you batty. Yet, here we are. Flash-forward to an undisclosed time in the relative present: the Autobots work for the government, under the rule of head honcho Mearing (Frances McDormand), running covert anti-terrorism missions (how covert can a mission involving gargantuan robots really be?!) all over the globe, while the disgraced Decepticons hang out with zebras and elephants in the African Savannah. Sam Witwicky (Shia LeBeouf) has graduated college, been awarded a medal for bravery by President Obama and, oddly, is unable to find any means of employment. He's supported by his loving British girlfriend, Carly (Rosie Huntington-Whiteley), who works for shady venture capitalist Dylan (Patrick Dempsey - an unexpected riot in a stock role). Unbeknownst to the jealous Sam, Dylan gets him a job at a tech company run by the eccentric Bruce Bazos (John Malkovich), where he comes across classified information regarding powerful Transformer hardware buried on the dark side of the moon. Soon, it's a mad dash between the government and the Decepticons to retrieve the crucial technology, called "pillars," which may well spell doom for the entire planet. 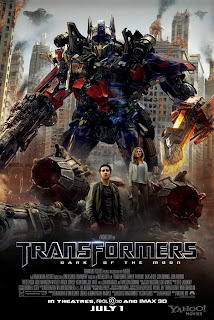 Many took issue with the previous Transformers film for its incoherent story which, according to Bay, was an ill-fated result of the Writers Guild strike. I sincerely look forward then to hearing him defend the script for Dark of the Moon, by Fallen co-writer Ehren Kruger. Not only does this picture contradict sizable chunks of the groundwork laid by its predecessors, very little of the film stands up to rudimentary critical thinking. Why, for example, does the government not return earlier to excavate Sentinel Prime's crashed ship? I'd imagine, at the very least, the alien technology could have been worth checking out. 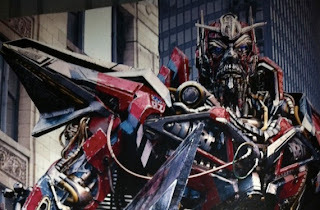 Why does a certain character not accept the Matrix of Leadership - an item which can resurrect dead Transformers - from Optimus Prime? Why does Carly push for Sam to assist in the Autobot cause, only to become infuriated minutes after he does? Further, anyone able to logically explain Dempsey's character's motivation and decisions deserves to be heroically paraded around town on a float to great fanfare. Yes, I know, I know. Transformers movies aren't about story, they’re about skull-quaking action. That's all well and good, however it's difficult to generate any type of emotional reaction to epic special effects battles when their reason for occurring makes so little sense. There is an hour-long sequence in which the city of Chicago is utterly demolished (Why Chicago, you ask? There's no good answer to that question, other than the fact that, thanks to The Dark Knight, the city has become the go-to locale for large-scale summer-movie heroics) that is truly ambitious and daunting in scale. Nevertheless, because the previous 90 minutes of build-up is so messy and ridiculous, the climactic set-piece's impact is severely diminished. It doesn't excite or exhilarate, it just happens. Bay also makes a curious creative decision with his human characters: they’re all portrayed as being insane. Not, like, quirky insane, but full-on foaming-at-the-mouth-and-ready-for-the-mental-ward insane. LaBeouf, usually the dependable grounding force for the series, is now an entitled jerk who has no less than three scenes where he devolves into a spastic, screaming lunatic. Returning once more are John Turturro's kooky former agent character, now a crazed author with unrepressed passion for McDormand's borderline incompetent g-woman, and Julie White as Sam's lusty mom, who this time discusses her son's, um, organ size and the importance of cunninglingus. Never one to be out-weirded, newcomer John Malkovich appears to have spent his time on set ingesting narcotics, and is really terrible in a truly mesmerizing way (one has not lived a full life until they've seen Malkovich tickled into submission by a Transformer). Rounding out the peanut gallery are Ken Jeoung, as a hyper-agitated tech nerd with critical info, who drops his pants and forces LaBeouf into a toilet stall, along with Alan Tudyk, who plays Turturro's gay German assistant as if auditioning for a Sprockets movie. Even the lower-key characters played by Dempsey and Huntington-Whiteley behave in ways no rational human being ever would. There's a place for broad caricatures such as these but, when the fate of the universe hangs in the balance, a certain level of gravitas is needed in order to build tension. By cramming Dark of the Moon with grotesque oddballs, the filmmakers undercut the dramatic stakes and rob their epic of a pulse. The childish raunchy humour from Revenge of the Fallen has been toned down; though Bay's other obsessions are still unmistakeably present, including fetishistic depictions of military gear, obvious product placement, blatant allusions to real-world historical tragedies and a borderline-creepy penchant for immature misogyny (Huntington-Whiteley's entrance consists of an leering handheld close-up of her underwear-clad derriere as she navigates her apartment). That said, he delivers the (surprisingly brutal) overkill enthusiastically and, due to the picture being shot for 3D, his robot-on-robot fisticuffs are - for the first time ever - actually comprehensible. Gone are the days of the bewildering blurs of fractured grungy grey chaos; this time around we can usually tell who is hitting who, and with what object. Thank heavens for small miracles. It'll be interesting to see where the Transformers franchise goes from here. The property has become too profitable to abandon, though Bay and LaBeouf have both stated that they're done with the series, and this film sends a significant portion of its characters to an early scrap yard grave. My hope is that the inevitable reboot cuts down on the unnecessary bloat and makes a conscious attempt to bring the Autobots and Decepticons to the forefront and give us a reason to feel affection for them beyond nostalgia. Bombastic end of the world scenarios can be a lot of fun when there's dynamic, genuine personalities involved. It’s too bad no one behind Dark of the Moon seemed to understand that.